Anyone who paid any sort of attention this MLS season knows Philadelphia Union did not have a great campaign. But they had their moments. Here are some of their most spectacular plays of the year. In this match against the eventual MLS Cup Champions, Fabian Herbers slips C.J. Sapong a pass behind the TFC backline. With only Clint Irwin to beat, Sapong rounds the keeper to the left and taps it in to tie the game at two-a-piece. Andre Blake had another incredible season between the sticks. There were many saves that I could have chosen for this list, but this was the pick of the bunch. Sacha Kljestan fires a low ball from the right wing into the feet of one of the most prolific scorers in MLS over the last few years, Bradley Wright-Phillips. He stabs at the ball to redirect it towards goal, which seemed a certain goal. Andre Blake had other ideas, unfortunately for BWP. He reaches down to his right and stops the ball from crossing the line with his paw of a hand. From Chris Pontius’ cross, 5-8 Fafa Picault does his best Shaquille O’Neal impression and posterizes A.J. DeLaGarza en route to thumping the ball with his head into the back of the net. A truly spectacular athletic feat and definitely a PSP Play of the Year. After Caleb Calvert’s incredibly odd sending off, when he reentered the field without being prompted by the referee, Haris Medujanin curls a beautiful left-footed free kick over the rooted Rapids wall and past former United States World Cup hero Tim Howard to give the Union a 2-1 lead and, incidentally, sending the stadium into raptures. Alejandro Bedoya puts in a cross that appears to totally miss its intended destination. However, Fafa Picault is lurking in the box and hits the looping ball with force down into the ground and just below Bill Hamid’s collapsing body to give the Union a 1-0 lead. With his first touch after coming onto the pitch, Roland Alberg receives the ball from Jack Elliott around 30 yards from goal. Roland looks up and shoots. Since he fell as he shot, the ball bends outward away from keeper Cody Crooper and snuggles into the right side netting. A spectacular goal that came out of nowhere. One of Sporting Kansas City’s Homegrown Players, Dániel Sallói, rips a 30-yard bullet at Union back-up goalkeeper John McCarthy. The shot dips and moves to leave McCarthy scrambling. While moving towards his right, he somehow dives back to his left and parries away the screamer. Ray Gaddis crosses an unimpressive ball, which Crew SC defender Alex Crognale deals with horribly. The ball flicks to the far post where C.J. Sapong bicycle kicks it back into the center of the box towards Ilsinho, who fires it on goal. All former Philadelphia Union Youth player Zack Steffen could do was get his fingertips to it. He could not stop that rocket. The Union stunned FC Dallas with two incredible goals before the 22nd minute. The first was produced from an incredible passing combination between Haris Medujanin and Ilsinho. Medunjanin easily gets past his FC Dallas counterpart with a left-to-right ball roll then passes inside to Ilsinho. Ilsinho then provides a phenomenal spinning back-heel back to Medujanin, perfectly weighted for him to continue his run. He passes across the six to C.J. Sapong who slides to complete the stunning move. The second goal was an incredible volley by Ilsinho off of a half-cleared long throw-in which nestles in the bottom left of the net. What do you think about the selections? Did we miss anything? Wasn’t the first play the highlight of Jay Simpson’s season rather than a CJ Sapong goal? 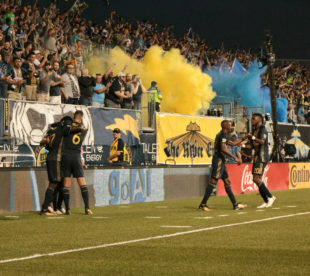 The Haris to Ilsinho to Haris to CJ goal was one of the best the Union as an organization – have ever scored. My takeaway from these season highlights is… that Ilsinho is easily the most frustrating player on the squad. Capable of moments of sublime brilliance, he spent many of the season’s games simply disappearing without a trace. I’m not unhappy that he’s been re-signed for next year, but it’s tough to know what his role should be.